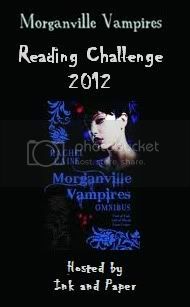 I've Started a Challenge - Morganville Vampires Reading Challenge 2012! Over on my fantasy blog, Ink and Paper, to celebrate the news that Rachel Caine will be released another three books to the series, I will be hosting the Morganville Vampires Reading Challenge 2012! There are five different levels, so there's something for everyone, whether you're an old fan or have yet to try the series, there's something that should be doable for everyone! There will also be contests and prizes! I will be taking the Bishop level challenge, which means I'll be attempting to read all the 13 novels that will be available by the end of the year, plus all Morganville Vampires short stories! I do hope some of you will join in with me, it should be fun! Sounds fun! I've only read the first book in the series, but definitely liked it. 13 books is daunting, but I definitely admire you for the ambition! I'll be checking out your posts as you read/reread! Lori - You can choose a lower level! You could maybe try the level for books 1-6? Amie - How about trying out the first level, for books 1-3?